“The planetary system will be a colorful corps de ballet / that will whirl to the beat of musical light / EVENING OUT / I’ll have to wear my tails / But who will be my date to this astral midnight frolic?” Published for the first time in 1924 in Mexico City, Radio is a fascinating bilingual edition of the poetry of Kyn Taniya, a “cult classic of the Mexican avant-garde”. Kyn Taniya was the pseudonym for Luis Quintanilla (1900 – 1980), a poet whose house was frequented by the likes of Apollinaire, and who founded the Theatre of the Bat modeled after La Chauve-Souris in New York. His pseudonym becomes a new persona; the dedication is “In Memoriam / To Luis Quintanilla”, a pronouncement of his previous self’s death. Futurist flourishes abound, in the form of descriptions that don’t make immediate sense, emphatic statements in capital letters, exclamation points, and appearances of blood, shrieks, lynchings and “burning men [who] lustfully fertilize / the lukewarm wombs of ecstatic virgins.” David Shook’s translation effectively retains the tone of the original, at once exuberant, aggressive and lyrical. “I travel alone / My brain sings and is the motor / The Moon-rays / tremble like antennas greedy for messages.” The poet becomes an antenna for ecstatic visions, and readers become antennae as their eyes move over the pages, trying to pick up what signals they can from the words. From the ocean of text, lines float up, knock against one another, and give each other meaning through collective rhythm rather than individual sense, force of phrasing rather than clarity of images. Dynamic graphics by Daniel Godínez-Nivón, interspersed between every few pages of text, are a perfect accompaniment, a bit like a self-administrated Rorschach test. Black and white drawings done with pen and marker can remind one of distorted chessboards, mottled fish, violently splayed butterflies, cross-sectioned UFOs, fragments of fuselage or crowds of fleeing high-heeled women. The disconcertingly festive cover continues these designs in yellow, like a doily from a childhood birthday in which tiny holes are snipped and unfolded into party decorations. The text is followed by two “uncollected poems” and a translator’s note. This explanation is often a work of art in its own right, either placing a work in historical and biographical context, linking it to current politics, or connecting it to translators’ personal interests and lives. David Shook, based in Los Angeles, mostly takes the last approach, telling us that he came across Taniya’s work on a two-disc album in Valencia, and that was drawn to it because it seemed “so incredibly contemporary”. Shook had recently been working with Russian Futurist poems by Boris Dralyuk and Brazilian Modernist manifestos. According to him, Taniya “probably had access to both Marinetti’s school of Italian Futurists and Wyndham Lewis’ British Vorticists during his formative years” and “is known to have originally composed some of his poetry in French”, which later he translated into Spanish, making his poetry “blossom”. It would have been intriguing to know more about Taniya and the origins of his strange cosmic visions (as well as how he ended up on a multimedia disc in Spain). 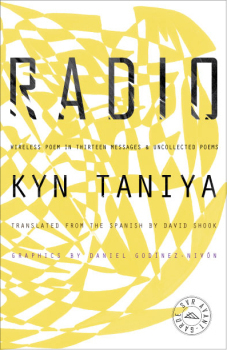 With the choice of what is translated often as interesting as how a translation is carried out, one may be finish the note still curious about Taniya’s reception in Mexico. As is, the book retains its mystery, arriving in the present like the fragment of a lost poetic project, sending signals to receptive new antennae. Kyn Taniya (A.K.A. Luis Quintanilla, 1900 – 1980) was born and grew up in Paris, where his father worked as a diplomat. His house was frequented by Tablada, Urbina, Apollinaire, Rodin, and his godfather, the Mexican poet Amado Nervo. He visited Mexico for the first time in 1918, and entered the foreign service in 1921, eventually serving as Mexico’s Ambassador to the Soviet Union. He began writing poetry in French, which he later translated into Spanish, as in the case of his first book, Airplane (1923). His second, Radio (1924), was his last, though he continued to write and teach as an important figure in Mexico’s estridentista avant-garde. That same year he founded the Mexican Theatre of the Bat, modeled after La Chauve-Souris, which he had seen in New York City. David Shook (translation) is a poet and translator in Los Angeles, where he founded Phoneme Media, a nonprofit publishing house dedicated to showcasing new voices through the art of translation. His debut collection of poetry, Our Obsidian Tongues, was longlisted for the International Dylan Thomas Prize in 2013. His translations include work by Mexican poets Tedi López Mills and Víctor Terán, who writes in Isthmus Zapotec, as well as the novellas of Mario Bellatin. In 2012 he served as Translator in Residence at the Poetry Parnassus in London, a festival organized as part of the cultural olympiad preceding the Olympics, which featured a poet from all 204 competing olympic nations. In addition to his work as a poet and publisher, Shook has made short literary films in Bangladesh, Cuba, Equatorial Guinea, Mexico, and other countries. He serves as contributing editor to World Literature Today, Ambit, and Bengal Lights, and has published his work in dozens of magazines, including Poetry and Oxford Magazine. Daniel Godínez-Nivón (art) studied Visual Arts at the National School of Fine Arts at UNAM and holds a Master’s degree from the same program. In 2011 he co-authored the book, Multiple Media 3. His individual work has been presented in the Tlatelolco Cultural Center of UNAM and his collaborative work has been presented in the installation Jardín de Academus: Laboratorios de arte y educación in the MUAC as well as the Museo Van Abbe in Holland in 2014. He was awarded the Becario del Programa Jóvenes Creadores during 2011 – 2012 from the Fondo Nacional de la Cultura y las Artes for the project Tequio_Rolas. In 2014 he studied at the National School of Fine Arts in Paris. Jessica Sequeira is a writer and translator from California, living in Buenos Aires. Radio is published by Cardboard House Press. Author, translator, and artist bios courtesy of the same. Posted in Book reviews and tagged kyn taniya, mexican avant-garde, poetry. Bookmark the permalink.